These fresh peach muffins with white chocolate chips are truly summer in a bite. Ripe, juicy peaches are tucked into a batter delicately flavored with vanilla and studded with white chocolate. 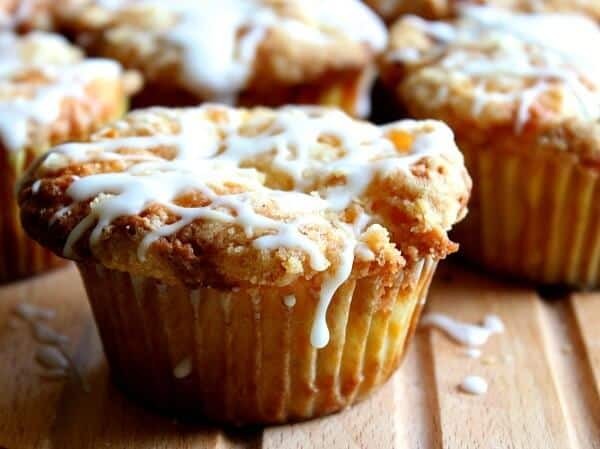 A streusel is sprinkled on top and then, after the muffins are baked, a bourbon flavored glaze is drizzled on top. Talk about a show stopper! There aren’t too many things that are more welcoming that muffins for breakfast — at least not in my opinion. Muffins say welcome home, I went to a little trouble but not too much. Muffins are basic love food… like cookies. I was writing an article for a magazine assignment I had about Parker County Peaches. Now, if you don’t live in Texas you probably don’t know about Parker County but it is the state center for amazing, giant, juicy, sweet peaches. The kind of peaches that when you take a bite the juice runs down your chin and then tickles its way down your arm to drip off your elbow — and you don’t even care. The kind of peaches that make you say, Georgia? Is that a thing? Anyway, so I was writing the article and I added this recipe that I had developed a while ago. It’s based off my blueberry white chocolate muffin recipe, as a matter of fact. Since the magazine is a statewide publication rather than a national one I decided to share a version of the recipe right here. Because I am cool like that. If you don’t have fresh peaches available then use frozen and a little extra sugar if you need it… also if you accidentally spill a tablespoon or so of bourbon into the muffin batter I won’t tell. Now, if you are in Texas, or near-enough, this year’s Parker County Peach Festival is July 11 in downtown Weatherford. I think I am going to try to get down there this year but time will tell… we are going to Port Aransas for vacation this year and that cuts it somewhat close. Not sure I can afford to go traipsing around the state that much. We’ll see. In the meantime… peaches. Most definitely fresh peach muffins. With chocolate chips. And streusel. And bourbon glaze. The following contains one or more affiliate links. If you click and buy the blog gets a small commission which is used to help support it. Thanks so much! I used paper liners here because my silicon ones are scattered all over the house. My daughter makes sugar scrub in them and takes them to the shower. Another child puts crackers in one and hauls it to the media room… you get the idea. So, while they last forever I need to buy them often. I like them because they are firm, environmentally responsible, and I think the muffins hold their shapes better in them. If you don’t have any, and you’d like to try them, here are some on Amazon. I like these because they are pretty AND they are BPA free. Put paper liners in muffin cups or use the silicon liners that are available. Combine flour, sugars, baking powder, salt in a bowl. Stir in milk, egg, butter, and vanilla. Fold in the white chocolate and peaches. Combine the dry topping ingredients in a bowl. With cold fingers rub butter into dry ingredients until the mixture is crumbly and looks like coarse crumbs. Mix the confectioner’s sugar, bourbon, and cream together to create a runny glaze. Sprinkle the topping on the muffins. Bake for 20-25 minutes or until a wooden pick inserted in center comes out clean. Drizzle the glaze over the top. I would love these for a quick breakfast or an afternoon snack! They look delicious!! They are. I love the peaches in this. I am absolutely drooling over these! This is the kind of baking I can handle. Going on my MUST TRY list! I love peach desserts! I’m always drawn to those dishes on menus! I love muffins! And I agree with you, they’re the perfect “welcome home” thing. I frequently make then when we have overnight guests! Love the use of peach here and that glaze takes these over the top! What a glorious sweet summer muffin idea! My peach tree looks to be going strong this year! Can’t wait to make these muffins! Kinda jealous of that peach tree, Trish. 🙂 Let me know what y’all think, Chrisy! Beautiful, and makes me crave summery peach season so badly! Love that there is streusel topping AND a bourbon glaze. My kind of muffins! These look tasty. I look forever to the flavor of peach again here soon. Come on peach season! These would be the perfect on the go breakfast! Yep. I love muffins for exactly that reason. Love your recipe Merye..can I use other fresh fruits other than peach? bookmarked it! Yes you can! I’ve made it with blueberry as well. Very good. Mary, Have you or any other the other folks here ever made this recipe as a “Coffee Cake”. I want to take this to a social breakfast, and think with all the other offerings, A coffee cake could serve more people. If you have not considered it as a coffee cake, do you think it would adapt well? Diana… I thought I answered this? I haven’t but I think it would work fine! Let me know, ok? They just came out of the oven and they smell sooooo goood! Abby! Thank you so much for commenting! I would LOVE to visit Vienna someday – it’s so beautiful! 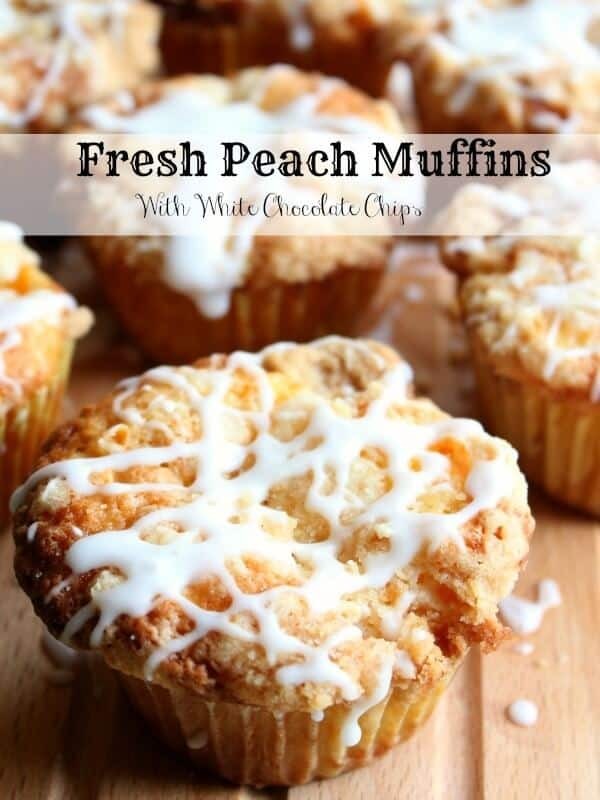 Peach muffins are my favorite, and you made them even better with white chocolate chips! Can’t wait to make these! These look really, really good Marye! Yep. I ended up using frozen this time.Thanks! We live in Georgia and nothing better than the peaches here, I am anxious to try this recipe for the next crop! These look absolutely perfect! can’t wait to try one! These look and sound fantastic! Definitely on my list of things to bake this weekend meaning a week of quick on the go breakfasts or snack for my family. Thanks for sharing! Cheers! Pinned for when all our Georgia peaches come in season! !